I didn’t have the news on yesterday and was totally ignorant of this fire that’s been going on since about 10:30 Sunday morning. That is, I was ignorant til I got to work around 4 today. Once I hit the interstate on the way to work, I could see a massive black smoke cloud and wondered where the hell it was coming from. I was pretty accurate when I guessed Deer Park, about 20 miles east of downtown Houston. I saw the footage when I streamed the news at work. 6 tanks were on fire, another empty one catching. The first ones were burning off gasoline components into the atmosphere at the Intercontinental Terminals Company plant in the ship channel. Just looking at that smoke made me want to be ill, even though I was at least a dozen miles away. I’m no stranger to chemical plant venting, but this isn’t venting–it’s a freaking fire! I wonder how the hell it started, and if/when they’ll find that out. Methinks there’s another Seconds from Disaster episode to make now… me and my engineering disasters bug. Anyhoo, I admit this is damned disturbing to me. I know I’ve driven by that plant and those tanks maybe a thousand times. This isn’t some event taking place “somewhere else”–those tanks are freaking huge! I mean, the chopper footage gives some good idea as to size, but when I drive by them, I can’t even imagine how much material those things can hold. I’ve always looked at them and wondered how big they were on the inside, and what they looked like in there. It’s just crazy… and makes me worry. ITC’s gotten some flack the past decade because of their policies regarding chemical venting and dumping. One of the main reasons I quit my old job was because of those damned chemical plants out there. I worked outside 95% of the morning. On dark and rainy days, I could flip a coin and expect a migraine. I think it wasn’t much of a secret that plants in the area would use the weather to hide an increased venting in chemicals. At least, that’s what I was told they were doing. The problem is my nose is as good as a drug dog’s nose–too much of that awful smell and my senses are all screwed. I am sick by mid-morning each time I’d come in from my cleaning rounds after being out in that weather, smelling that chemical smell. Yeah, I used a lot of sick hours thanks to that crap. And now this billowing black smoke will keep coming. They suggest it could take two more days to burn itself out. That scares me because I can already think of the many kids and asthmatics that’ll be racing the the area hospitals in the next few days, especially if the wind shifts. Heavier particulates were already falling and affecting residents, according to what I’d heard. Considering the supercell-sized cloud generated by all that smoke, I’m not surprised. photo credit: Steve Gonzales, Staff Photographer Houston Chronicle. 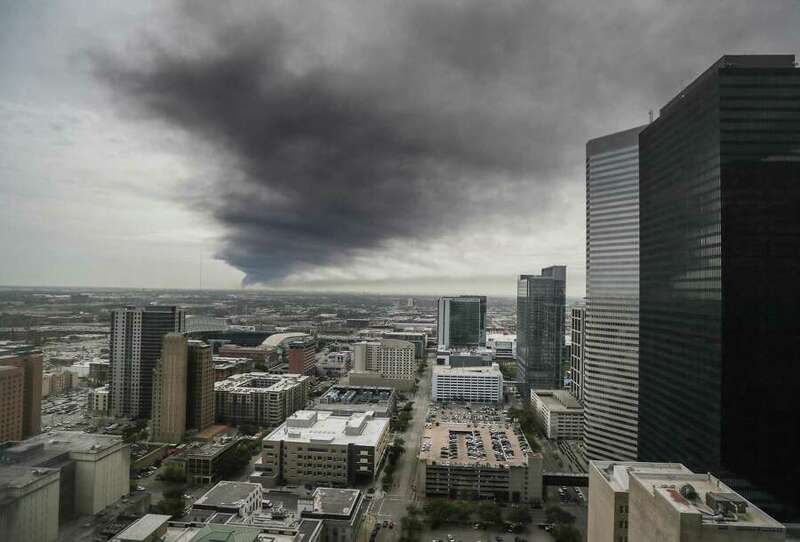 This is taken from Downtown Houston, on a 31st floor office, over 20 miles away, a day after the fire started. I wonder what the hell happened out there, and why there’s a fire. At least one of the tanks was empty, so that’s a small relief… but it’ll still require round the clock containment. Thankfully, nobody was hurt or killed that we know of. I hope like hell it doesn’t get worse, but wow–it’s so strange when you see something like this happening relatively close to you, and probably affecting people you know personally. And I really wanna know how the hell it started.